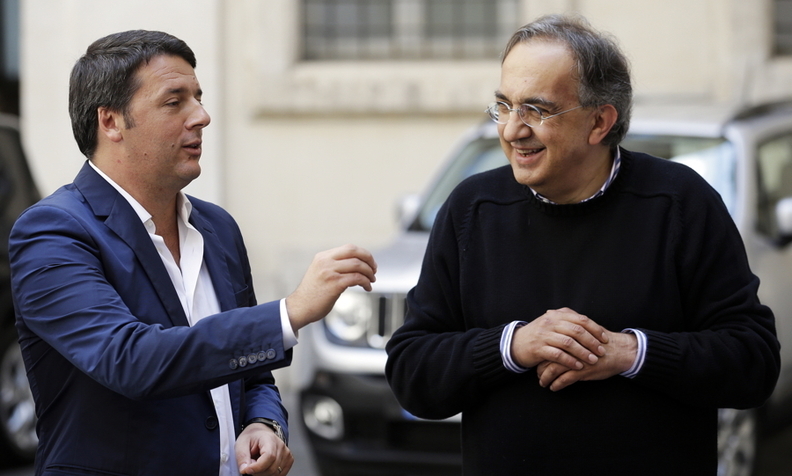 Italian Prime Minister Matteo Renzi (left) gestures next to Fiat Chrysler CEO Sergio Marchionne during a meeting in Rome in July. Italian Prime Minister Matteo Renzi said Fiat Chrysler Automobiles’ decision to have a home base in London matters less than the jobs and opportunities that the combined company will create in Italy. “For me, the location of the finance and headquarters operations are not important,” Renzi said to reporters Sept. 25 in Michigan during a joint press conference with Sergio Marchionne, CEO of Fiat SpA and Chrysler Group, which are combining. Fiat’s merger with its U.S. unit will create the world’s seventh-largest automaker to better compete with heavyweights such as General Motors, Volkswagen Group and Toyota. Shares of the new Fiat Chrysler Automobiles are set to begin trading on Oct. 13, which Marchionne pointed out is Columbus Day in the U.S., a national holiday in honor of the Italian explorer. The combined company will have its main stock listing in New York, rather than Milan where Fiat is traded, and will be legally registered in the Netherlands with a London headquarters. Fiat is based in Turin, Italy; Chrysler in Auburn Hills, Michigan. The automaker’s new board will meet in late October and evaluate its capital structure, including weighing the possibility of issuing new stock. Marchionne said last week he was bypassing the usual pre-listing road show for investors. Marchionne gave Renzi a tour of Chrysler’s headquarters before the press conference. He said he showed the prime minister the new Chrysler minivan, scheduled to be produced in Windsor, Ontario, Canada, next year. Marchionne reiterated that he would not seek government money in Ontario for the Windsor plant.